His great new album Fresh Air is out now. The more I think about having my personality downloaded into a computer to be treated like a binary coded lab rat, the more overwhelmed I feel with dread. That's the concept behind Homeshake's “Getting Down Pt II (He’s Cooling Down),” premiering today on The FADER, but it's only slightly horrifying. The video is directed by Pierce McGarry, a funny and distinctive voice in music videos with frenetically absurd clips for Mac Demarco, Walter TV, and Alex Calder. In this new visual, Homeshake 2.0 sings his smooth and soothing R&B while his image surfs through stock visuals, TED Talks, and big JNCO jeans. 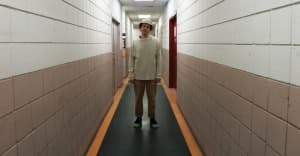 "The video shows my consciousness uploaded to the world wide web, which is unfortunately not far off from my daily routine," Homeshake told The FADER over email. "My favourite part is when I land the 900." Homeshake's new album Fresh Air is out now via Sinderlyn.